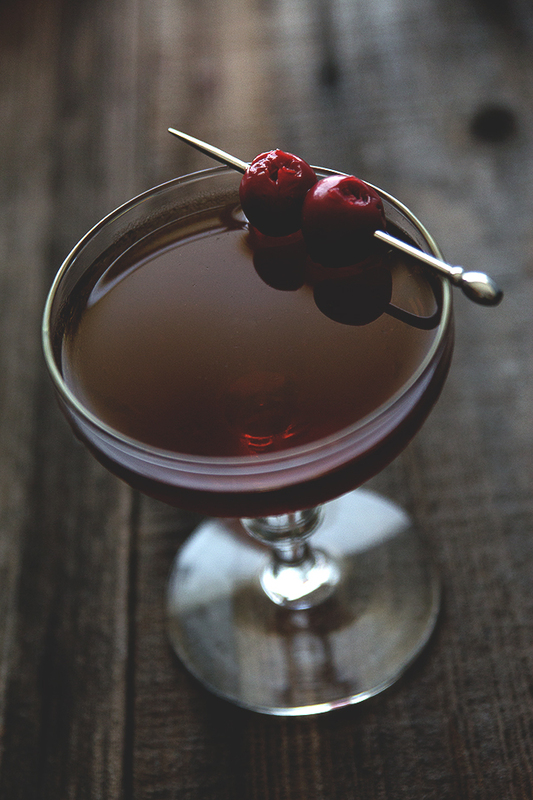 As you know, I’m a big fan of the classics, the Manhattan being no exception. It is without a doubt on my cocktail Mt. Rushmore (now there’s an idea for a post) both for its taste and its simplicity. Whiskey, vermouth, and bitters . . . what more do you need? These three ingredients are a mainstay on my home bar. I’m a rye guy, but if you prefer bourbon feel free to make the switch. 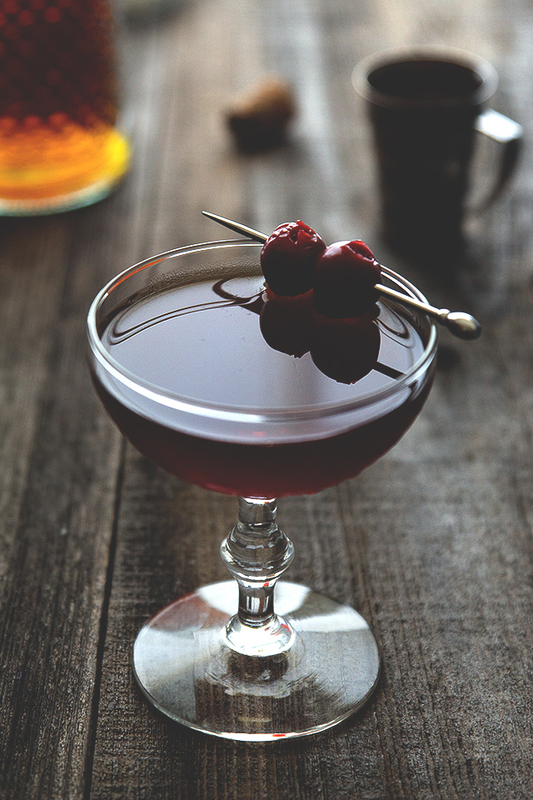 Whiskey, sweet vermouth, and bitters make for one of the all-time classic cocktails. 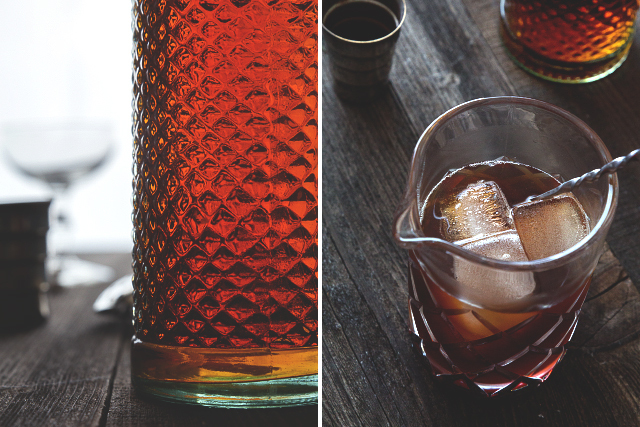 Add the whiskey, sweet vermouth, and bitters to your mixing glass. Fill your mixing glass with ice and stir for 30 seconds to chill. Strain into a chilled coupe glass. 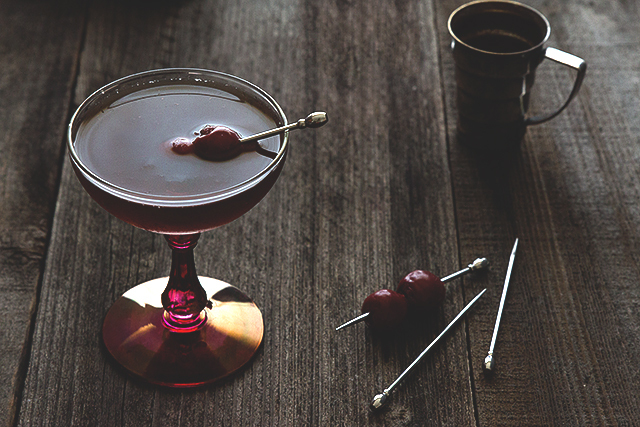 Garnish with a few brandied cherries and enjoy! My mother gets one of these only once a year on a special occasion as she’s diabetic and isn’t allow to consume too much. It is her favorite drink in the world and I never knew what went into it (I adore whiskey!!!). It sounds amazing and in her honor, next time I’m out for dinner or with friends, I will order this. Thanks for posting the recipe! Lovely, Todd! As a whiskey gal, I’m surprised at how long it took me to like the Manhattan. I had a number of them early on in my whiskey days and loathed the taste of the vermouth. I also do not like maraschino cherries, or at least the flourescent red ones that used to come in Manhattans regularly. Also, I must note, most of the Manhattans I’ve ever had were served drastically warmer than they should be. Nowadays I make them at home and switch up the vermouth depending on what kind of rye or bourbon I’m using. The right vermouth makes all the difference! I’m with Pete on this one, I like mine with a lemon peel. The essential oils lighten things up a bit, which I enjoy. Thanks for your thoughtful comment, Emily! I am SO anti fluorescent red cherry, you have no idea. I’ve never enjoyed them, not one bit. To be honest, I don’t think I’ve ever done the lemon peel in the Manhattan, but it looks like I better give it a shot thanks to you and Pete. I’ve started making my rye manhattans with a lemon peel garnish and will probably never go back to cherries, but they are classic for sure. I’m a rye lover too – why mess with what’s good? Definitely on my ‘drinks I can make and not think about’ list. Rye is the only way to go here. Lovely pics too! Gorgeous cocktail! WIsh I had one right now! Oh how I love me a Manhattan! And such pretty pictures too. <3 is all! We’re Manhattan lovers in this house, so I’m paying close attention. You’ve really captured it’s ‘personality’ in these shots beautifully—pinned! Thank you Sue!! 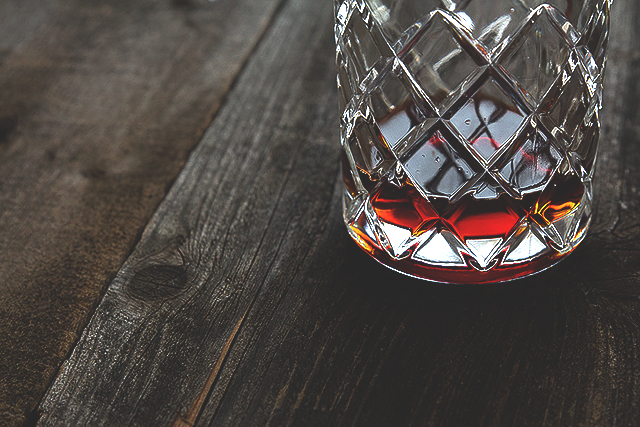 Do you usually prefer bourbon or a rye? This looks really delicious and right up my alley. Did you DIY those cherries? That is high on my list but I need to wait until cherry season. Thanks Dulcie!! No, I bought these ones. I can’t wait to DIY some this year too! This looks lovely. I’m totally enjoying classic cocktails right now (Negronis are my current obsession). 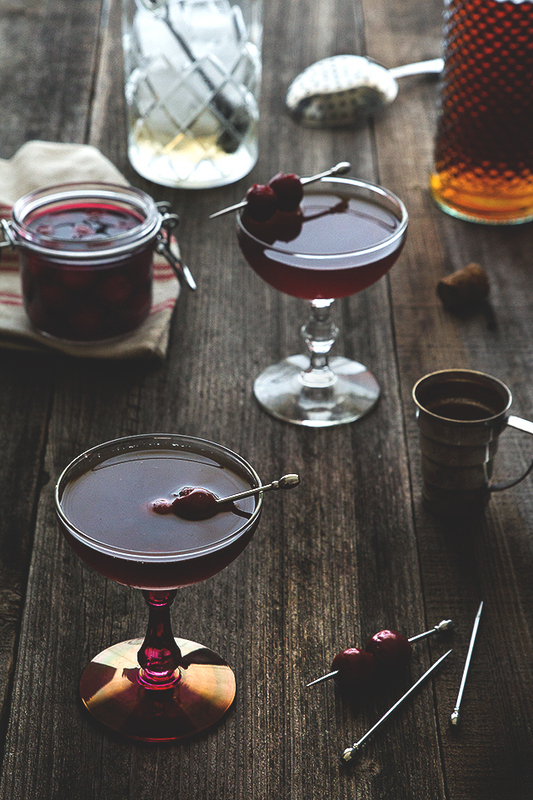 But I’ll take two of your Manhattans, please-and-thank-you. Cheers to you Todd! Just about my favorite cocktail. You stuck to the classic recipe… nicely done. And beautiful photos, too. Typically, I’m a vodka or gin drinker, but lately with the bitter cold, all I’ve wanted is something to warm me up, and whiskey really hits the spot. I would love to try making these at home! Gorgeous shots. Fabulous post and photos, my friend! I am a bourbon girl, thru and thru. And, I agree…the Manhattan has it all. It’s aces. What more could a guy or girl want? Have a wonderful weekend, Todd. Cheers! Straight aces!! Thank you Stacy! Thank you SO much Homer! I had a feeling you’d like this one. As soon as I saw this, my whole being said yes. Yes. That is what I need. So you know, one please.